The "Honours of Scotland" are the crown jewels and they consist of a crown, a sword and a sceptre. The crown was made in 1540 from gold melted down from the previous one, with additional gold mined in Upper Clydesdsale. More precious stones and pearls were also added and the crown was first used by King James V at the coronation of his second queen, Mary of Guise (mother of Mary Queen of Scots). Pope Julius II presented the sword to King James IV in 1507. It was made by an Italian craftsman, Domenico da Suttri. The sceptre is the oldest of the crown jewels. It was made in 1494 and was presented to King James V by Pope Alexander VI. The three Honours of Scotland were first used together at the coronation of the infant Mary Queen of Scots (daughter of King James V) in Stirling castle in 1543. They were last used at the coronation of King Charles II at Scone on 1 January 1651. 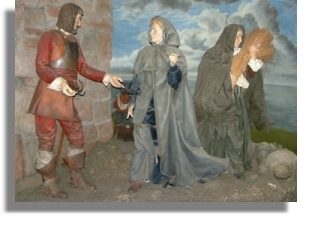 During the occupation of Scotland by Oliver Cromwell during Puritan times, the jewels were hidden first in Dunottar castle. When the castle was besieged, the local minister's wife smuggled them out and they were buried under the floor of Kinneff church. 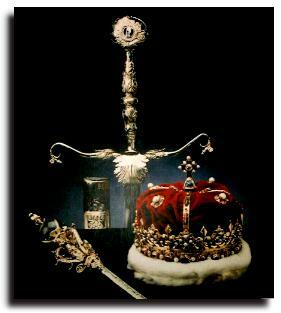 Under the terms of the Treaty of Union in 1707, Scotland's crown jewels were retained in Edinburgh castle. 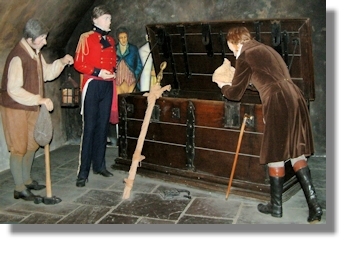 Forgotten for over 100 years, they were rediscovered by Sir Walter Scott in 1818 and put on display in the castle where they have been on view to the public ever since. The display of the crown jewels was added to on St Andrews Day, 30th November 1996, when the Stone of Destiny was brought back to Scotland - in 1296, 700 years earlier, King Edward had stolen this precious relic on which generations of Scottish kings had been crowned since the days of the Kingdom of Dalriada in the 9th century.